As a species, we’ve done a pretty bang up job making the rest of the planet incredibly dangerous for other animals. Ask any badger and they’ll tell you, “humans are the worst.” Roadways are particularly treacherous to the rest of the animal kingdom. But a Japanese auto parts and service chain, Yellow Hat is doing its part to help some of our four-legged companions on this big blue orb navigate the dangers of the streets. 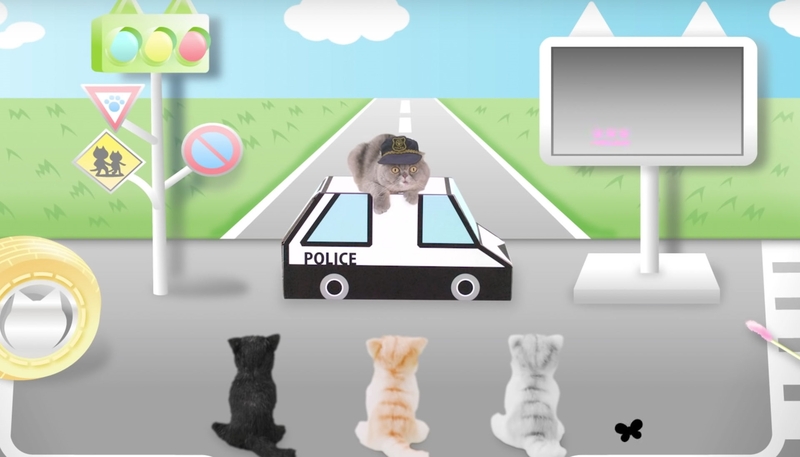 The kitty constable then shares important pearls of wisdom like “don’t jump out into the street!” which are accompanied by videos of cats behaving badly on and near roadways. Some of these felines are played by people dressed as cats and some are puppets. I know, I’m also disappointed in Yellow Hat for giving cat roles to humans. According to the fine humans over at Sora News24, the video was created specifically to engage cats. It was put together with help from Kyoto University’s Camp-Nyan animal psychology research team. In addition to having something moving around on screen at all times to keep the intended viewer’s eyes on the video, the background music has chirping birds and sounds that resemble squeaking mice. During a scientific test with my own cats, they were intrigued by the video for roughly 15 seconds before walking away. To be fair, neither goes outside and they’re more fans of French New Wave films. But if they do become outside cats, I’ll be sure to sit them both down and let Officer Whiskers lecture them about the dangers of the road. Also, please be aware while you’re driving. Slow down for humans and animals.